Sikinos island, Cyclades: Days drenched in sunlight, genuine delights, a sense of a past time of innocence and unspoilt beauty. With limited tourist development, Sikinos island is the ideal place for peaceful holidays. Chora is the capital of the island, constructed on the slopes of a mountain and with amazing view to the Aegean Sea. This is among the tiniest and most picturesque villages in the Cyclades, with the characteristic Cycladic architecture. The port of Sikinos Greece is the most tourist place, with an organized beach and few tourist facilities. The beaches are secluded and can be reached on foot or by bus. The most interesting sightseeing on the island is the Monastery of Episkopi. 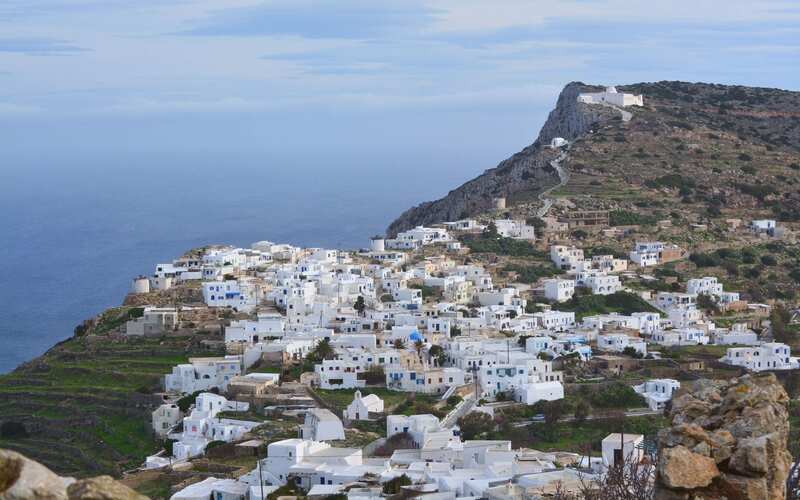 Sikinos island, Small, unspoilt and close to Ios and Folegandros in the southern part of the Cycladic chain, offers visitors what they want from a holiday. Sikinos has its own special way of offering visitors what they want from a holiday. It promises a stunning collage of natural scenery, spiritual exultation, tranquility, a very human touch and intimate contact with past tradition. These are the elements that comprise the rugged and attractive charm, encouraging alternative tourism by remaining true to its origins. Time to forget the frenzied city pace as the boat approaches the harbor of Alopronia. For a while you will tune only to the pulse of the island and live dreamlike moments in landscapes masterfully crafted by wind and wave. The Hora is a delicate vignette with two different backgrounds, the mountainsides of Kastro and Horio. Kastro, built on the edge of a cliff, is a fortified hamlet dating back to the 15th century. When you enter through the authentic side gate, you are welcomed by white houses over 100 years old, alleyways scented by jasmines, yards with bougainvillea, geraniums and vine trees. Three windmills stand proud at the clifftop, facing out to sea. In the square, visit the collection of post-byzantine era icons. Horio, to the south, has all the beloved features of a Cycladic island. A labyrinth of narrow alleys connects houses, flower beds and tranquil hidden corners. Once here, a look around the folk museum is a must. Located in the square of Kastro and built in 1787, it houses a gilded wooden screen. Built on the highest point of Kastro in 1690, it served as a refuge for residents against pirate raids tormenting the island. Take an early evening climb and enjoy the seamless blue of sea and sky. It is a special monument and testimony to long history of overlapping cultures and religions. It is inland and consists of the main temple, the chapel of Agia Anna and abandoned cells. It was initially built as a Roman mausoleum in the 3rd century AD and converted into a Christian temple in the 17th century, with a dome, bell tower and chancel. The beaches of Sikinos are virginal with clear blue waters. The sandy stretches of Alopronia, Agios Georgios, with a pebbly consistency, and Dialiskari, with a natural sunshade of tamaris trees, are all accessible by car. If you decide to go by caique or take a footpath, your choice widens to an array of beaches with blue-green waters, such as Agios Panteleimonas, Santorineika, Agios Ioannis, Karras and Maltas. Come during the days of a religious celebration and you will have the opportunity to experience the “Panigirades” custom. After the procession, members of the faith assume the responsibility of keeping a holy icon in their home for a year. On the next holy day depicted on the icon, they are responsible for the organization. This cave in the north, under the monastery of Hrisopigi, is among the most beautiful of the Cyclades and accessible only by sea. Between Kastro and the monastery of Hrisopigi is a chapel “floating in the air” devoted to the Holy Mother of God, the Joybringer. Pledged to Sikinos by revered poet Odysseas Elitis, the construction of the chapel was overseen by his partner Mrs I. Iliopoulou with the help of contributions from the island’s Municipality. This delightful spot is imbued with an atmosphere of innocence and natural beauty; a vantage point across the Aegean that Elitis himself extols for its “crystalline” clarity. Remnants of ancient hamlets, Byzantine churches, gorges, remote beaches, glades with panoramic views and lush nature are some of the island’s “gifts” to hikers. Sikinos Hotels, Sikinos is a secluded island in Cyclades Greece, considered an alternative destination of the Aegean Sea. Look and search Sikinos accommodation, rooms, hotels apartments, studios and pensions.